A scholarship endowment was established through the Hill Country Community Foundation in the name of Burnet Ex-Students Association in July, 2015. 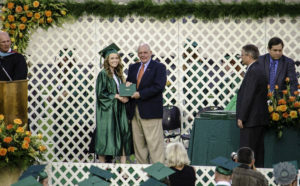 Contributions to the fund may be made by issuing a check payable to “HCCF, Burnet Ex-Students Association Endowment.” Annually, a scholarship will be granted to a Burnet graduate. The 2017 scholarship recipient is Charlsie Floyd.